Lately I’ve been working on re-inventing Poison Sweet’s image. I was dissatisfied with the UI, so I decided to change it (easier said than done). While I was at it, I tried coming up with a logo for it. I’m not very good at creating logos, as you may have noticed from my previous games, but I tried, okay?! Save menu with a delete button. Le gasp! The background still isn’t final, but I like its overall look. 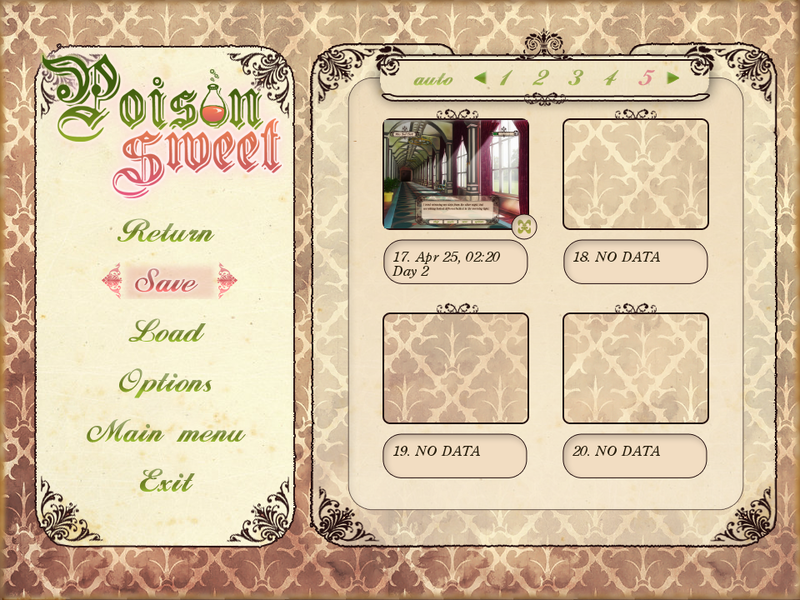 I’m still debating what to do with the “poison/sweet bar” (the top right bar, that’s what I like to call it. hehe). It’s basically a classic love points bar, but it’s influenced by more than just interactions with Ayrius. It can be changed by the MC’s reaction to certain pieces of information or events. 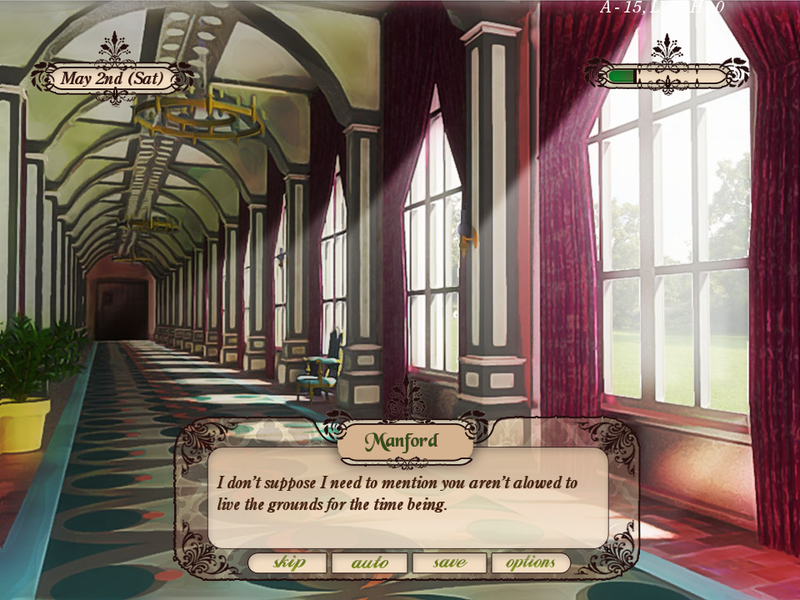 For four weeks until the wedding, from Monday to Friday, you can choose a place in the castle to spend your time: the library, dining hall, kitchen, gardens, your own room and eventually a nearby town and -hee hee- Ayrius’s chamber. Is that Ayrius’ or Ayrius’s ? Gah, I’m never naming my characters names ending with s again! So anyway, these places are where events can happen, but even just visiting some of these places will grant or withdraw a point. This is why I think the p/s bar is necessary and shouldn’t be kept as a cheat like in Summer found me. The problem is, do I want to display it from the start? I’m thinking the second playthrough is better, since it might ruin immersion and all that. Personally I like to pick choices as I would in real life on the first try, so the poison/sweet bar might hinder that. Maybe I could even make a hide button, for people who want to try their luck on their own? What do you think? If you’re thinking the bar makes the game too easy, let me tell you something… you can’t go back on your choices in this game! I’ve decided I want to be evil. Muahaha. To be fair, you CAN rollback if you’ve just clicked on a choice, since the points are usually added after the conversation/event is over, so if you click by mistake, you can try again. So if on working days you pick your destination, what about the weekends? Well, you get one ‘date’ with Ayrius each weekend, with a total of four dates. By date I mean he takes you to some random place, without you having any say in it. >.> Dude needs to work on his manners. Yup, I just pinned the blame on an imaginary character, deal with it. The different endings I have planned will not only be unlocked by the p/s bar, because that would be too easy to code (*sigh*), but by discovering secret shtuff and building relationships with other characters, mainly Helena (the cook), Leonore (Ember’s friend), and another secret(?) character. There will be sad endings, so get your tissues ready. Of course, everything I’ve written here is subject to change, cause that’s how I roll. Like I said, the bg isn’t final, but I think the text is easy enough to see. Did you look at it full screen? The cream colored part of the textbox has something like 10% transparency, but I really want the part of the sprites behind it to be seen, at least a little bit. I can almost promise my games will always have a good ending, because I can’t stand the thought of frustrating my players so much. Then again, not sure if our definitions of happily ever after are the same. I can guarantee at least one ending in which no one dies. I am so generous, I know. XD Not sure how many endings there will be in total, but around 5 maybe. I’ll post something here when the game’s ready to be tested. Right now it’s so far from ready I can’t even imagine how it will look in the end. I’m not even sure what/how many endings it will have XD Should be fun to figure out. UUU DELETE BUTTON ALL HAIL YOUR AMAZING IDEA! Vaaai să nu cumva să-l scoţi e cea mai convenabilă chestie everrrrr mai ales că eu la primul joc salvez înainte de fiecare alegere and it gets reaaally messy. Fabulous backgrounds. Just fab. Bara aia ascunde-o, fă-o vizibilă la alegere or smth, u know wat to do. Mersi pt entuziasm. nu mi-e clar daca iti place bejul sau il urasti, doar ca ai sentimente puternice fata de el. delete button e boss, nu? nu stiu de ce nu l-am bagat pana acum. secret chara e… nu zic nimic. it’s better that way. If you don’t mind me asking, how did you get the X delete button to be on top of the save file image and not get covered by the screenshot-thumbnail? It all depends on the order you write them in. First write your add screenshot line and then the imagebutton.